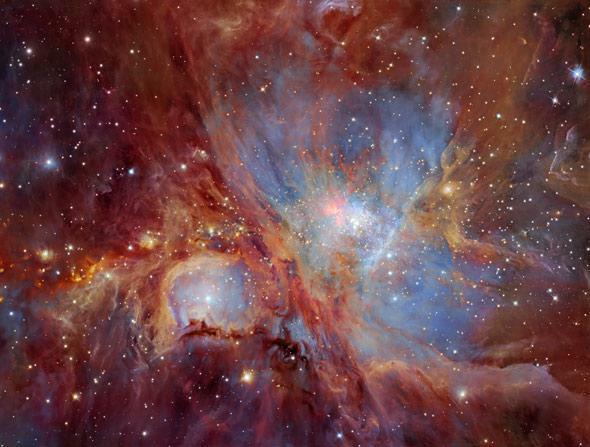 New observations give details on the how the Orion Nebula formed. Left: The Orion Nebula seen in the near infrared by the HAWK-I telescope. Right: The outlined region imaged by ALMA showing ridges of higher-density material being pounded by expanding gas in the cloud. Click to ennebulenate. I’ve written many times about the Orion Nebula, one of the most magnificent star-forming regions in the galaxy. It’s a spectacular gas cloud, wispy and sculpted, multicolored and bright. It’s only about 1,400 light-years from Earth, making it close enough to study in detail. What you see isn’t really what you get in the nebula, though. The visible portion is just a cavity in the side of a much larger dark complex of gas and dust called the Orion Molecular Cloud. This is cold material, so it doesn’t shine in visible light. Massive stars born near the edge of Earth-facing side of the OMC are incredibly luminous, and their fierce ultraviolet light has heated the gas around them. The gas expanded, and popped through the side of the cloud like a blister (I know, ewww, but bear with me). All that wispy gas we see is inside that cavity. But the stars still shine, and still blast out ultraviolet light. That light travels easily through the hot gas making up the Orion Nebula but is stopped by the denser material of the Orion Molecular Cloud. As it’s absorbed, the molecules in the cloud get ripped apart. This creates a boundary region, a fuzzy borderland between the hot thin gas and the cold dense dust/gas cloud. A wider view of the nebula shows stars forming everywhere, wisps and tendrils of expanding gas filling the cavity in the side of the cloud. This material glows at many wavelengths of light, but it’s been difficult to study at some radio wavelengths because telescopes have lacked the resolution, the sharp eyesight if you will, to discern what’s going on at the border. But the new Atacama Large Millimeter/submillimeter Array, or ALMA, uses the combined might of many radio telescopes to peer more closely into the sky, and now astronomers have taken a good look at that region. They observed what’s called the Orion Bar—a region of the cavity where we’re looking down into the blister along an edge, like peering down into a bowl. This area is where the onslaught of UV light is absorbed by the dense cloud, and can be used to test our understanding of the physics there. What they found is a little surprising. The expectation was that the hot gas and bright UV light would eat away at the denser material slowly, creating dense knots of material surrounded by hotter material. Instead, the ALMA data showed the transition region was much narrower, with ridges of dense material right at the boundary. This implies things are happening there much more dynamically, with the hotter, thinner gas slamming hard into denser stuff as it expands away from the stars. I was interested to read that the individual ridges and lumps are quite tiny, with only 0.005 times the mass of the Sun. That’s far too small for their own gravity to make them collapse, so it’s unlikely that stars will be born right there. The clumps need to be much larger to have their gravity compress them sufficiently to form stars. I know this sounds a bit esoteric, but it’s important. Billions of stars form in molecular clouds like these across the galaxy, including, most likely, our own Sun. It’s possible we were born in such a chaotic nursery, seeded from material between the stars, and the actual birth perhaps induced by a collision between two clouds, or compression from the winds from a nearby dying star. Understanding these complex volumes of space is, literally, understanding how we came to be. What can be more important than that? Alexander Pope wrote that “the proper study of Mankind is Man,” but I have always felt that the proper study of humanity is the Universe. We are, after all, a part of it, and studying it is studying ourselves. And when it is as mind-expanding, as amazing, and as lovely as the Orion Nebula and the cosmic building materials therein, how can we resist? So go, wondrous creature, and mount where science guides!